These ceramic pots and pans are so nice to use, they are also perfect for a gift since they come in sets with different sizes and colors. But because of this, there are common mishaps that it contains lead. Which is of course, not safe to ingest, that is why we are going to be tackling about that in this review along with the best ceramic cookware in the market today. Ceramic is a non-metallic and organic materials like pots and pans that are made of clay and is typically hardened by the use of heat. Some people often think about the dangers of using ceramic cookware and is scared to use it because of the chemicals and toxins that might get mixed up with the food they are cooking. It also reminds people of pottery since it is made up of clay. But ceramic cookware is much more sturdy than glass cookware or metallic cookware which makes it better even it is is also breakable. It is also extremely easy to clean since it is scratch-proof with a non-toxic ceramic glaze surface. It is also good when it comes to cooking without oil or butter. High-temperature won’t ruin its exterior or interior design. It can be used on stove-top also in the oven and even with the broiler. On the barbecue as well. You might have heard about the PTFE or PFOA (which are chemicals used for making another type of cookware, the Teflon). Recently, as a substitute for Teflon, ceramic non-stick cookware became a thing is almost the most popular type of cookware in the market today. The reason is that ceramic coating provides a non-stick feature without having to worry about the dangers of PFOA. These ceramic coated pots and pans are actually made of aluminum instead of clay. Unlike the 100% ceramic cookware, the ceramic coated ones are non-stick BUT it does not last long. These type of pans and pots cannot go into the microwave since they are not 100% ceramic. These are dishwasher safe compared to the ceramic coated ones. NOTE: Always bear in mind that when you buy any ceramic cookware, it should be MADE IN USA. Since only the US have manufacturing standards when it comes to ceramic cookware. They are 100% guaranteed lead-free and some other countries do not really require rigid safety. These pretty pots and pans are very safe when you put it in the oven for baking or roasting. It all features an aluminum and sturdy hard enamel porcelain exteriors which make the cookware very durable. The enamel collection all have rubberized stainless-steel handles and also incredible shatter-resistant glass lids. Another good set of ceramic pans is the Wearever cookware set. These are aluminum ceramic coated pans that are scratch resistant and also can be used in a lot of ways of cooking. These pretty pots and pans are perfect for cooking different kinds of meat and fish. It has a silicone handle with makes it easy and safe for you to get hold of it without being scared of burning yourself. The wherever cookware set is probably the most long lasting cookware that you can purchase from the market today. 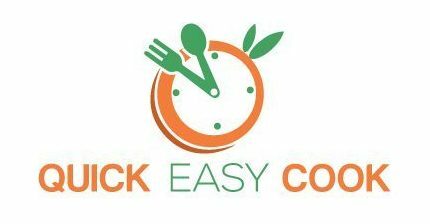 It cooks healthier meals because you don’t have necessarily need to use too much oil when cooking meat, fish or poultry. Unfortunately, if you haven’t known already, these are not ceramic cookware but only an aluminum ceramic coated cookware. See the Difference above. These pans and pots were only good during the first couple of times it has been used. Discoloration of the products was very disappointing and also some reports stated that the food sticks to the pan when it’s hot. Because of its Thermolon ceramic non-stick surface, it makes it easier for to wash and clean despite it being an aluminum ceramic coated cookware. This is also perfect cooking family dishes and the kids would definitely love the turquoise color. It is also dishwasher safe even if it is easy to wash by hand. Thermolon is a fantastic heat conduction which can make your fried meat perfectly brown and even when cooking and does not contain and toxins or chemicals that can harm a human being. After just a couple of months of usage, it got a bit difficult to scrub since the food won’t come off of the pans when used for frying. The covers can be kind of dangerous since the glass can shatter when it has been exposed to heat especially when used for boiling. Now that is scary. The bottom of the pots and pans rusts rather quickly compared to other brands of ceramic cookware. You need to get a potholder in order for you to touch the handles and when it gets too hot, a chemical odor comes out of the pan. 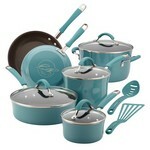 It is obvious that Rachael Ray Cucina Hard Porcelain Enamel Nonstick Cookware Set, 12-Piece made it to the top. It may not be perfect but it has a lot of good points compared to the others. Also, it comes with a really nice color despite it fading rather quickly since it is just a minor detail. It doesn’t come with any type of danger which is one of the most important things when it comes to ceramic cookware. Leave a comment and let us know what are your experiences using this ceramic cookware.